On Sunday last, my exhibition of new seating forms opened at Manning Clark House in Forrest. a suburb of Canberra. For those of you who don't recognise the name or know anything about the building, a brief potted intro. Manning Clark was a historian, which isn't of itself wildly interesting, except he was pivotal in establishing Australian history as its own worthy discipline rather than as the poor distant cousin to the mighty histories of our imperial masters, American cousins or European forebears. Clark was the first professor of Australian history at ANU, and whilst there also wrote his six volume History of Australia. The home that he and his wife Dymphna commissioned in 1951 was designed by the Melbourne architect Robin Boyd. At the time, Boyd was establishing himself as one of Australia's modernist pioneers, writing weekly columns which attempted to persuade and badger the average aspirational suburban dweller to aspire to something more interesting than neat edged lawns, pastel laminex and a Hills hoist. 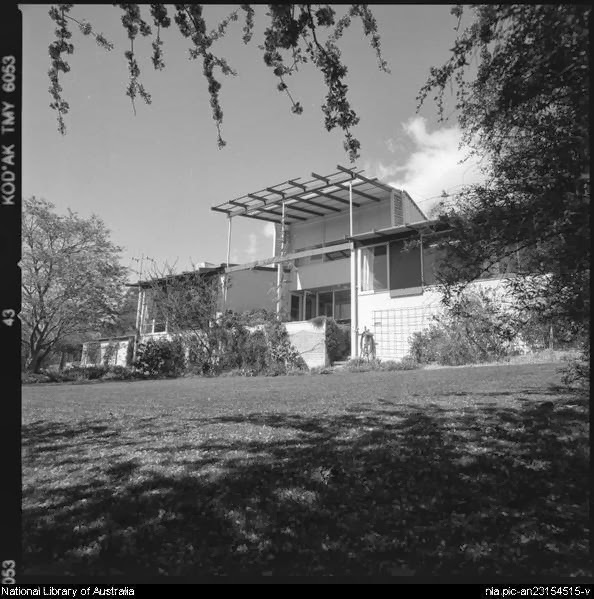 The house he designed for the Clarks is one of his earliest pieces, and one of only two domestic dwellings built in Canberra. At the time when the house was built, most of the surrounding blocks were still empty. The neighbouring areas had a mixture of Canberra's arts and crafts bungalows of the 1920s and 30s, and the more imposing pastiches of English garden suburb grandeur. Boyd's gleaming white modernist temple set on a ridge with its diurnal wings must have been starkly visible and starkly representative of the dreaded bohemian life of the Clarks, and their arty smart university set. The Clarks were very engaged with the cultural and political life of both Canberra and Australia more widely, with the house famous for its dinners, soirees and social life of discussion, gossip and intellectualism that university towns such as Canberra can occasionally throw up. Following Dymphna's death in 2000, the house has remained pretty much as it was during their long occupation, and now provides a wide cultural and political program, including small exhibitions. When I was first offered an exhibition opportunity, the history of the house, its occupants and its architect suggested differing narratives that an exhibition might explore. One theme in particular still fascinates me. The internal spaces that Boyd designed are both well scaled to the domestic but also uncompromisingly modernist in intent and ambiance. Frequently such homes are either fitted out with modernist interiors or furnished with pieces by Eames, Meadmore, Featherstone, and by the 1960s, the Scandinavian moderns. When I first visited the house, I assumed, wrongly, that the chairs filling the lounge room were gathered to replace pieces that presumably the family had taken on Dymphna's death. Instead, as the photos shot in the late 1990s show, they are the chairs, tables that the family used during their decades of occupation. The Clarks took the very bold decision to commission a modernist architect to build them a home and yet furnished it with objects that made no claims to a modernist ideals whatsoever. A few Ward pieces which are somewhat Barnes-like in their simplicity; a couple of astonishingly heavy oak baronial chairs, and a scattering of a few other odds and bits and pieces. I was gobsmacked. That an architect such as Boyd did not force his clients to furnish the house as he would have assumed they should posed a fascinating question. How would you furnish the living spaces? Boyd, unlike a lot of architects, did little furniture design. He certainly used a lot of built-ins but at at the time, he hadn't designed his own range of pieces to fill his clients' homes. But even in the early 1950s, Australia had a number of furniture designers and manufacturers producing modernist work. In other buildings (such as the Fenner House) Boyd did specify modernist furnishings. A brief investigation of the Clark-Boyd letters in the NLA didn't offer an explanation as to how or why they avoided the dictates of Boyd's modernist interiors. But then reality came to visit and after a few weeks' sketching up pieces, having less than 6 months to make a roomful of furniture whilst also having to most tediously earn a living put paid to those notions. And there was another factor - it is very presumptive to assume that the Clarks' choices of their own furniture had no validity. So I returned to what has been my obsession for over 15 years; ergonomic seating.